Take a look at this Creamy Zucchini and Corn recipe and you're sure to love it. 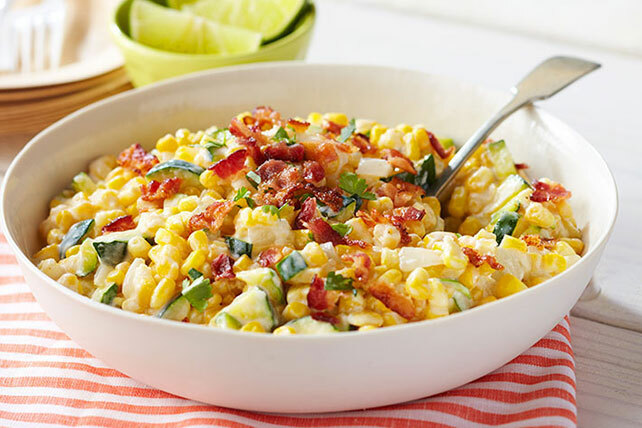 This Creamy Zucchini and Corn features Mexican-style cheese and bacon! Stir in cheese and sour cream; cook on medium heat 3 to 5 min. or until cheese is melted and vegetable mixture is heated through, stirring frequently. Top with bacon and cilantro. Prepare using KRAFT Lite Zesty Italian Dressing, and BREAKSTONE'S Reduced Fat or KNUDSEN Light Sour Cream. Drizzle with a squeeze of fresh lime juice before serving.